I have a different type of how-to for you today, completely unrelated to home improvement or farming (not that I am any particular expert in that area yet). This how-to is related to the dress that I sewed for my sister’s wedding. The bodice on this dress is made up of lots of pieces with a zipper in the side seam. The challenge when putting in that zipper is to line up all of the seams from front to back. I’ll admit that the first attempt was a big fat fail. Horizontal seams were stair stepping down the zipper. Not attractive. In fact, I couldn’t even bring myself to take a picture. Second attempt was much more successful. 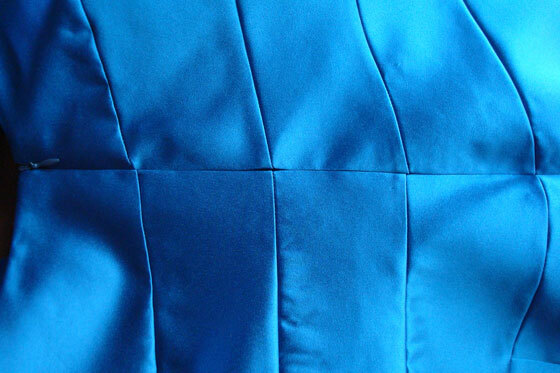 So, here’s my tutorial on how to line up horizontal seams across an invisible zipper. 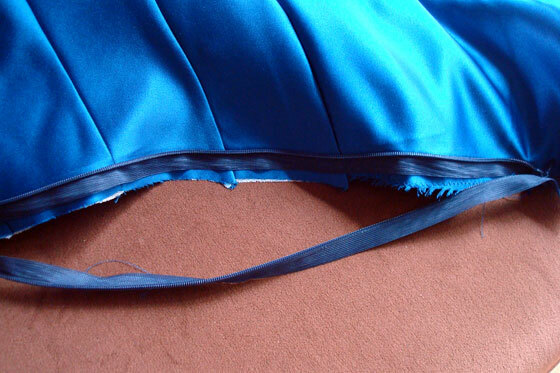 Sew the first side of your zipper to the dress, having the zipper open and leaving the other side free. 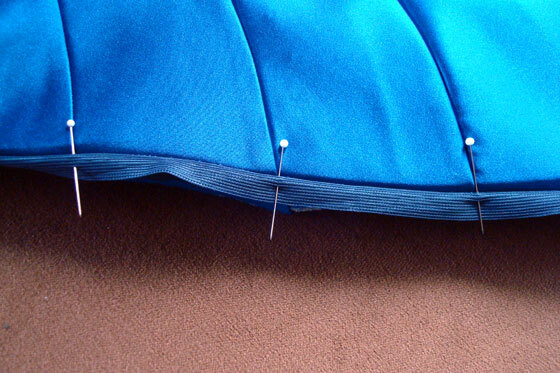 Close the zipper and, using pins, mark the seams that you need to match. 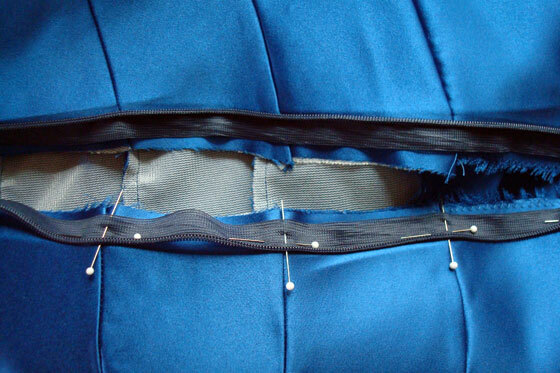 Insert the pins horizontally in the tape on the unsewn side of the zipper. Unzip the zipper, and pin the unsewn side to the dress, starting at each of the seams. Baste the zipper in place and stitch. When you close up the zipper, all of your seams should match. Or at least match close enough. Next week, I promise a return to our regular program of home improvement and country living. We’re heading into the first long weekend of “summer” and I have big plans. Chainsaws–not sewing machines–are involved. Hope you have a good weekend. Happy Victoria Day to my fellow Canadians. Wow! I can just hear my mom applauding from the great group of special souls she is with. Zippers to me are scary (maybe better with fresh eyes) and matching seams and fabric patterns was a special thing with my mom. Well done, once again. Have a great chain saw weekend. Thanks for sharing a nice memory of your mom. That’s good to know! It came out very nicely. It took a few tries, but worked out in the end.